Having Made This Bed, Will MLB 2K Lie In It Next Year? "In last year's game, we weren't getting enough of the hit types we usually see in baseball," Little, the game's senior producer, tells me. The designers wanted to introduce more of these kinds of outcomes—early swings on outside pitches that actually pull the ball, inside-out swings and the like—but wanted to be sure they happened with the appropriate frequency. So Little and his lead engineer built this tool, which simulates the outcomes in bulk and helps them refine the game's physics. Little clicks a button and, with a whooshing sound effect, the screen becomes a spray of arcs, like a fireworks finale caught in mid-explosion. A pitch outside still strongly goes to the opposite field, but with the better contact rating, more go to the center of the diamond and some even to left field. There's another unhappy dice roll to come, one that Little and his Visual Concepts team has no control of: Whether they're even working on this game next year. 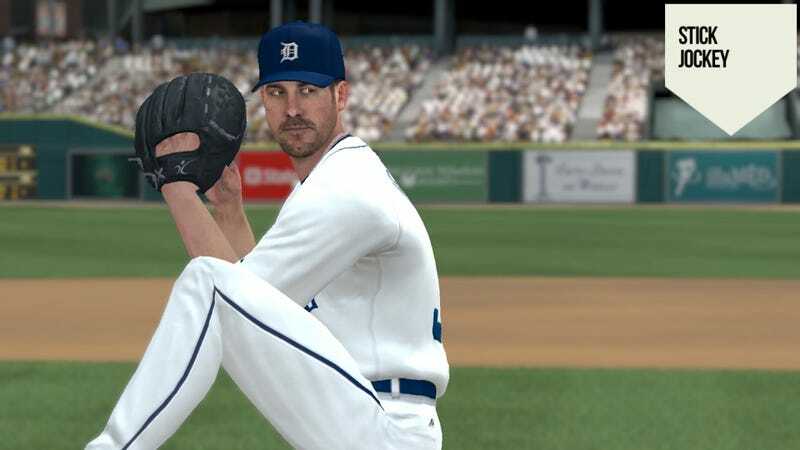 2K Sports' license with Major League Baseball expires this year, something that's been brought up every year since MLB 2K9 landed with such a gut-churning thud three years ago. I think it's more likely that, if we're talking about this concept next year, it's in another studio. That's barring something like another publisher buying out 2K's parent company. Electronic Arts bid $2 billion on Take-Two in 2008, and some analysts have suggested that Activision should do the same thing now, but an analyst's job is often to tell others what to do with their money. Everything 2K Sports does with this title leaves behind tea leaves for sports fans to read, and they got another cup full this week when 2K announced it will release a pairing of MLB 2K12, the flagship of a money-losing franchise, with the much more popular NBA 2K12, for $69.99-or $10 more than MLB 2K12 would sell for on day one. The cheapest you can find NBA 2K12 is $50 on Amazon. So the message sent here is either MLB 2K12 is a $20 game or NBA 2K12's a $10 one. Guess which one is closer to what consumers think. 2K Sports is trying to bootstrap its baseball franchise to its NBA title, which is a smart thing. NBA 2K has been an outstanding game for years now, certainly since the crisis of 2009 when 2K Sports took the MLB project away from Kush Games and saddled Visual Concepts with a nine-month development cycle that ended in disaster. Why 2K Sports waited until now to try this, and whether it signals an attempt to save its baseball marriage, or giving up on it, who can tell. But it may be a moot point. sharply reduced terms," said Michael Pachter, the noted games industry analyst for Wedbush Securities. "The last deal cost Take-Two $30 million a year in losses, and they can't renew it without a $30 million reduction in royalty—even then they would just break even." That assumes Major League Baseball would want to negotiate with Take-Two, 2K Sports' parent company. All Take-Two's senior leadership has done is disparage its own product and the value of the Major League Baseball brand. Even without Take-Two's conduct and mishandling of the franchise, MLB could expect to take a haircut in its next deal, and not just because everyone thinks Take-Two overpaid way back in 2005. Consider this: At no time last year, not even in its launch week, was MLB 2K11 on Xbox Live's weekly top 20 list of games played. I'm not sure I've ever seen any edition of the game on that list, to be honest. So what? Well, consider every other simulation sports title shows up there at some point, and many usually appear there all year long. In the middle of July, with MLB and the MLS the only major professional team sports in season, FIFA 11, NBA 2K11, Madden NFL 11 and NHL 11 all made the top 20. This isn't just online multiplayer—this is connected users playing any mode of the game. Also, remember this is the only baseball game on the Xbox 360, so it's not like there's a fragmenting of the audience across two or more titles. The Major League Baseball audience on the Xbox 360 is now literally smaller than the National Hockey League's in the middle of the summer. That will come into the discussion when MLB opens the bidding on its next Xbox 360 license. Furthermore, anyone picking up that license has an absolutely Sisyphean task awaiting them in the PlayStation 3 market. MLB 2K's repeated shortcomings, and frankly, its poorer visual quality by comparison, have helped make MLB The Show into a striking rarity: a sports video game capable of selling a console. A diehard baseball fan without a PlayStation 3 has had only one satisfactory option: buy one. Those with a PS3 are extremely unlikely ever to move. Only in name would an exclusive third-party license, which MLB is said to want again, involve the PlayStation 3. I'm not even sure nostalgia for EA Sports' MVP brand, goodwill built on a previous console generation, could make much of a dent in the dominance Sony's MLB The Show exerts over that platform. That will definitely factor into the risk a publisher is willing to take and the amount it's willing to pay. And that's assuming there's any label other than EA Sports who is ready to take over and ship a product by next March. Back in his office, a menagerie of consoles, controllers, monitors and papers, Little is again on the sticks, adjusting the pitch location, timing, contact and power. Round ball on round bat, the most difficult and inscrutable act in sports. He can batch-render the same swing on the same pitch at the same instant as many times as he wants to, and see just as many unique outcomes. How many times do you want to do this? Fifty? A hundred? Two hundred?